I have a confession to make: my husband and I are getting a little bored with our basic Valentine routine of just going out to dinner. After 10 years of marriage, we&apos;re looking for some new and different ways to spend time together. We&apos;d love to have a Valentine&apos;s Day date that includes great food, drinks, and something entertaining we can enjoy as a couple. Lucky for us (and you! ), Hendricks County has no shortage of great Valentine&apos;s Day destinations. You can dine at great local restaurants, enjoy some locally made wine or craft beer, and find a few romantic ways to spend time together. I&apos;ve assembled my list of destinations for the perfect Hendricks County Valentine&apos;s Date. 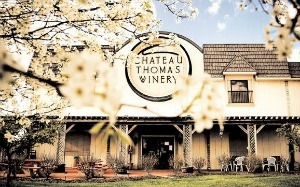 If you love delicious food paired with local wines, you will love the special Valentine&apos;s Day Dinner at the Chateau Thomas Winery tasting room in Plainfield. For $130, couples can enjoy a five-course meal. Each course is paired with a different Chateau Thomas wine. Musician Tim Brickley will be playing love songs as you dine, and the ladies will receive a fresh rose. For $240, you can even upgrade your experience with a hotel stay. Call Chateau Thomas at (317) 837-9463 to make your reservation. If craft beer is more your style, I recommend checking out Black Swan Brewpub on Valentine&apos;s Day. The atmosphere at Black Swan is more casual, but the food is delicious, and local brews, including Black Swan&apos;s own, pour from the taps. I can&apos;t get enough of their delicious fries with house-made aoli dips. Here are 10 more great tips for dining at Black Swan. Valentine&apos;s Day is the last day of the Chocolate Walk in Danville. This tasty journey will guide you through the charming setting of downtown Danville, and allow you to enjoy some delicious chocolate. A win-win! Fellow Hendricks County blogger Eric has a great preview of this event. The night before Valentine&apos;s Day, bring your date to the Bread Basket Cafe and Bakery in Danville for some live music. Singing duo Nat and Kat will perform live, and the Cafe will be serving decadent desserts during intermission. Tickets are $30 pre-sale and $35 at the door with a portion of the proceeds going to Sheltering Wings. Purchase your tickets at the Cafe or by calling (317) 718-4800. Danville&apos;s Gallery on the Square Paint and Sip allows you to enjoy your favorite beverage while you try your hand at painting. No experience is necessary. The goal is to relax and have fun exercising your creative side. 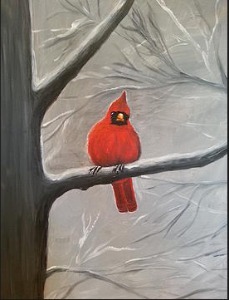 Their project for Valentine&apos;s Day is "The Cardinal," a gorgeous painting based off a local photographer&apos;s image. Make your reservation today. This event is sure to be a popular one! Plainfield&apos;s uPaint Pottery Studio provides another opportunity for couples to get creative on Valentine&apos;s Day. From 4 to 8 p.m., couples can come to paint a piece of pottery or try glass fusing. They will receive a 50% discount on their studio fees, and refreshments will be available. No reservation necessary; just drop in and be ready to create! Why not make your date night into a date weekend? Danville&apos;s Marmalade Sky Bed and Breakfast is the perfect cozy getaway for you and your sweetheart. It offers beautiful accommodations, with downtown Danville&apos;s finest attractions within walking distance. I was completely charmed by this lovely bed and breakfast, and I can&apos;t wait to stay there again. As you can see, there&apos;s no shortage of things to do in Hendricks County this Valentine&apos;s Day. All the elements of the perfect date night can be found here, and you&apos;ll make memories with the one you love that will last for years to come. Do something different this year, and take advantage of all the romance our county has to offer!